When you think of Sweden, what comes to mind? Water. Long days. Ikea. Meatballs. Winter. Alexander Skarsgard. What you might not think of is perfume. But I’m going to change your mind about that, thanks to Agonist Parfums. Last month, I spent some time with Niclas Lydeen, one half of the Swedish team who created Agonist. 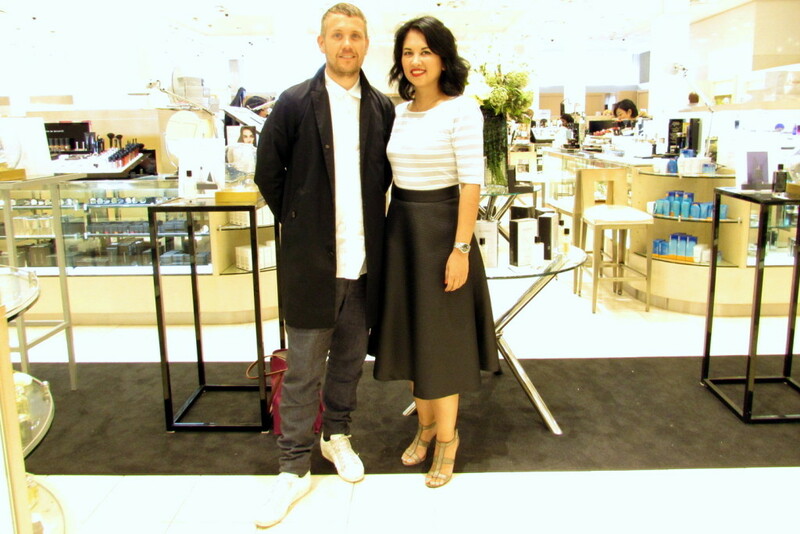 Niclas is a graphic designer, and his wife, Christine, who studied in Paris and has a background in fashion, founded the brand. Sweden does not have a history in the perfume business, so they drew inspiration from their home to create this unique line of unisex fragrances. In fashion, the top brands will create an haute couture line and a prêt-à-porter line. Haute couture is the “high fashion” line comprising exclusive items that are often custom-made. Prêt-à-porter is “ready-to-wear”, comprising clothes that are factory-made and finished for general consumption. Agonist’s line of 10 fragrances are structured the same way. Each fragrance is available in a limited edition, haute couture bottle, handcrafted by legendary Swedish glassmakers Kosta Boda. These sculptural bottles are truly works of art. 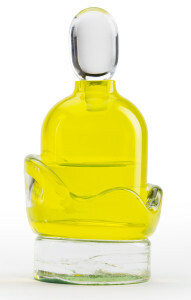 And for the masses, you can purchase the beautiful, prêt-à-porter crystal bottle that is more accessibly-priced. With Agonist, Niclas shared, “the scent is the hero”, so each limited edition bottle is inspired by the perfume it contains. For example, the Isis bottle suggests the start of spring. The bottle (left) is yellow, evocative of the sun or a bud emerging from the ice in Sweden. The scent is green and fresh. One of my favorites that I smelled that day was Agonist’s ativanoral first fragrance, The Infidels. The theme of this fragrance was inspired by Swedish poet Karin Boye. The Infidels smells of roses but has a warm feeling thanks to Lebanese Cedarwood and Bourbon Vanilla. Sounds delicious, doesn’t it? All fragrances in the Agonist line are unisex. Niclas and Christine start first with the idea for the fragrance; masculine or feminine does not matter. They work with five different perfumers who specialize in specific fragrance families. Each fragrance has a unique combination of ingredients, all of which you see plainly listed on the label of the prêt-à-porter bottle. Their most recent creation, No 10 White Oud, is a bold attempt to recreate a trendy ingredient in the world of fragrance. Oud is a resin produced when a specific Asian tree is infected with a mold. It’s distinctive, extremely rare, and very expensive. In No 10 White Oud, Agonist has made a Nordic interpretation of this musky scent. 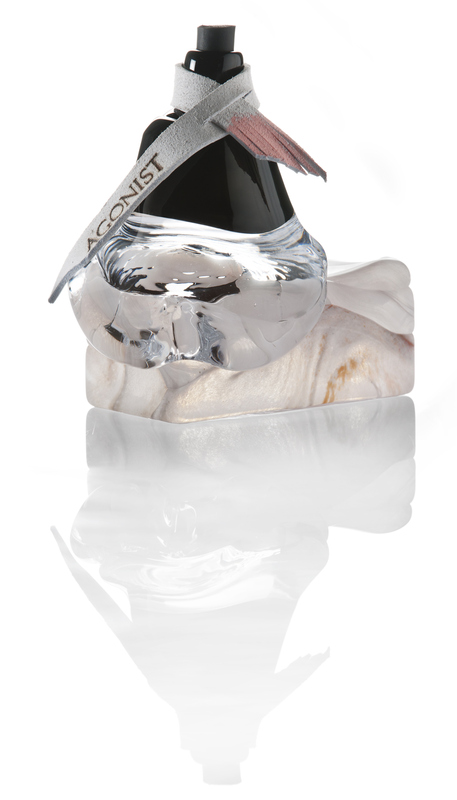 In the sculptural bottle shown above, you can see how the bottle containing the perfume mimics a resin emerging from the wood-looking bottom block of glass. Niclas was very generous with his time, and I feel fortunate that I had the opportunity to learn about this line. If you’re looking for a complex, unique fragrance, Agonist Parfums is worth a smell. You can explore their fragrances at select Neiman Marcus locations, including Houston, Dallas, and Washington. This entry was posted in Vanity and tagged Agonist, fragrance, haute couture, Kosta Boda, luxury, perfume, prêt-à-porter, Sweden on June 21, 2015 by jenn.